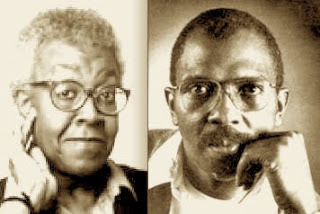 Last week we released the thirty-ninth episode in the PoemTalk podcast series, which concerns Ethridge Knight's "The Sun Came," written in response to Gwendolyn Brooks' "Truth." For this program, host Al Filreis, was joined by a panel of Tracie Morris, Herman Beavers and Josephine Park. 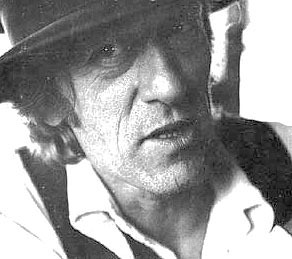 The recording used in this show comes from a 1986 reading issued on cassette by Watershed Intermedia, and at that event, Knight was introduced by Brooks, who addresses and reads from his poem in her opening comments. After listening to both Brooks' intro and Knight's reading of "The Sun Came," the panel begins by considering the strengths of Knight's voice and preformativity: "There's a lot of living packed into his voice," Beavers observes, while Park is struck by the poem's rhythmic cadences and Filreis and Morris address the differing perspectives between Brooks' reading of the poem's first line and Knight's. They then consider some of the poem's idiosyncratic language, such as the use of the word "goofed" — for Beavers, this is a double-entendre common in Knight's work, meaning both a mistake as well as "you don't take it seriously, you are putting on, you are signifying, you are performing a role," thus the poem's tone is "ramped-up." "Flipped" similarly brings the notion of betrayal, particularly, for Morris, a religious betrayal, the betrayal of the Son of God. After Beavers reads Brooks' poem, "Truth," Park comments upon the increasing impersonality of the poem, while Knight's response is quite intensely personal. "It's kind of hard to overstate the impact of Malcolm X in the black imagination, in the black consciousness, in his significance," Morris believes, and throughout Knight's work, particularly that relating to his imprisonment, she sees a great connection, a reaching out. While typically associated with light and liberation, Filreis notes that here, he's joined to "the night of sleeplessness and the shadows," which leads the panel to a consideration of the poem's use of puns — Knight/night, Malcolm/mal (evil) comes — and through this, Beavers finds a rebuke to Brooks (who "missed" the son/sun who came), while for Morris, the poem is "targeted at self-reflection in the black community." 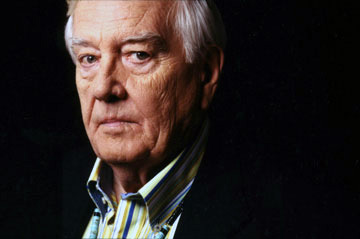 Even though, Beavers asserts, Knight maintains respect for "Miss Brooks," he marks the passage of intervening time between her poem and his response, during which the son/sun came, and therefore he is "in a position to comment on all the ways in which that possibility was not realized" — "where Brooks is speculative, Knight is reflective in a way that really gives him authority, and the fact that he's writing it in prison underscores that." Park picks up on Knight's statement that "the darkness ain't like before," asking, "what is this new darkness like: is it darker or is it less dark?" Filreis returns to the end of Brooks' poem, and in comparison, finds Knight's to be more of a "complaint for unawareness": he "privileg[es] day as something we must face and not miss." Towards the end of the program, Filreis asks about the metaphoric nature of Knight's idea of "night years," wondering how we should politically read this — how does it relate to the struggle for civil rights. According to Beavers, "even when we are in the dark, we're still facing the sun, and we still have to face the truth," and in the "post-Malcolm" era, "we're empowered to do that." Moreover, the poem speaks to a "longing for somebody to take us from darkness," creating a "narrative of what happened when that longing was fulfilled." Filreis sees a changing relationship for Knight, with allegiances shifting: "you brought us to a certain point, Miss Brooks, but now we've gotta go in a different direction." Morris disagrees, finding a confessional tone, and downplaying the strength of the three lines following "The sun came, Miss Brooks," which are set off by em-dashes as a parenthetical aside. Beavers then notes that Brooks wants the respect of Knight's younger generation of poets, remembering that she changed her own aesthetic style during that era, and Filreis plays off of this notion of lineage by recalling Brooks' reading of much of Knight's poem in her intro and then offering that he could come up and finish it. In conclusion, Park admires the confessional tone Morris pointed out, "the call and response, and religious fever that seems to be transmitted between one and the other," while Beavers is moved by "the political sophistication of the analysis in the poem" (which traces "Malcolm X's impact on the community") and Morris takes stock of "the physical and spiritual loss" that are so central to "The Sun Came." PoemTalk is a co-production of PennSound, the Kelly Writers House and the Poetry Foundation. If you're interested in more information on the series or want to hear the previous thirty-eight episodes, please visit the PoemTalk blog, and don't forget that you can subscribe to the series through the iTunes music store. Stay tuned for future programs in the series that will address poems by Joan Retallack, Susan Schultz, Ezra Pound, Nathaniel Tarn and John Wieners. Thanks, as always, for listening! If you're in Los Angeles this week for the annual MLA conference, we hope you'll join us for a very special event celebrating the rich history of Jacket and the bright future of Jacket2, on Saturday, January 8th from 7:00-8:15 PM in Olympic III, at the J. W. Marriott. Our panel will include Jacket founder John Tranter, along with Marjorie Perloff, Kate Lilley and Jacket2's editors, Julia Bloch and Michael S. Hennessey. Al Filreis recently posted a thread concerning the panel, which includes a summary of Tranter's presentation, and you can read more about it here. We're all looking forward to this exciting conversation — as well as the opportunity to interact with Jacket's readers and longtime fans — and will look forward to seeing you there. We'd like to thank everyone who took time out of their busy conference schedule to come to our MLA panel celebrating the legacy of Jacket Magazine and its future continuation as Jacket2. It was wonderful to hear Jacket founder John Tranter discuss the inspirations and ideologies behind his influential journal (as well as the enigmatic origins of its name, which are not a coded reference to his initials), and his engaging presentation was nicely complemented by thoughtful tributes from Kate Lilley (who discussed Jacket's hybrid nature as both an Australian and international publication) and Marjorie Perloff (who spoke to Jacket's great cultural value). Next, Jacket2's editors, Julia Bloch and Michael S. Hennessey discussed some of the exciting changes to come (in terms of both form and function) and gave the audience a preview of some of the things they can look forward to (including upcoming content and our initial roster of guest commentators), before bringing the evening to a close with a spirited Q&A session with the audience. From there, many of the panelists and audience members made their way over to Artshare for this year's MLA Off-site Reading (at which Jack, Kate, Julia and I all read). Organized by Andrew Maxwell, Mathew Timmons, Joseph Mosconi, Ara Shirinyan and Brian Kim Stefans, the reading featured more than seventy participants, including an all-star roster of poets in town for the conference and some of the best and brightest from Los Angeles' thriving poetry scene (all listed in the flyer above). Thanks to Timons, we'll be getting a recording of the event shortly, and Stefans is concurrently organizing a spontaneous anthology of poems read at the event, which we'll be very happy to share as well as it's completed. Stay tuned for all of these exciting developments and come back next week, when we'll resume our normal posting schedule with some very exciting content to kick of 2011 in grand fashion. Last summer, we brought you news of a very exciting new addition to PennSound — a mini-symposium on the life and work of Denise Levertov recorded as part of the Woodberry Poetry Room at Harvard University's "Oral History Initiative," which came to us through the graciousness of Christina Davis, curator of the collection. Today, we're very happy to announce a second, and equally exciting set of recordings from that project, this time concerning the one and only Charles Olson. 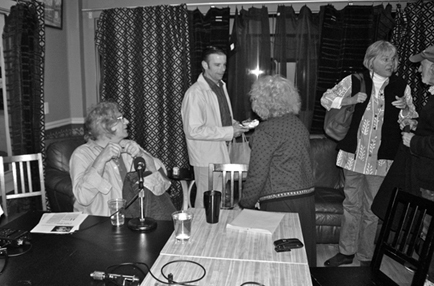 Recorded October 9, 2010 in Gloucester, MA during the Charles Olson Centennial Conference, Woodberry staff captured this impromptu conversation between Olson's friends and associates at a local café. Ammiel Alcalay starts off the event with a series of introductions and serves as interlocutor throughout. He's followed by Olson critics Peter Anastas and Chuck Stein, then the novelists Michael Rumaker and Ingeborg Lauterstein, who knew Olson at Black Mountain College. Poet, critic and publisher Ed Sanders brings the event to a close. In addition to these recordings, the page also includes a number of photos from the event, including the one above, which depicts (from left to right) Alcalay, Anastas and a number of other revelers. You can click on the title above to listen to all of these wonderfully intimate histories of Olson, and, of course, don't forget to check out our Charles Olson author page, the contents of which were discussed in a recent PennSound Daily thread celebrating the poet's centennial. Music with Roots in the Aether is a music-theater piece in color video. It is the final version of an idea that I had thought about and worked on for a few years: to make a very large collaborative piece with other composers whose music I like. The collaborative aspect of Music with Roots in the Aether is in the theater of the interviews, at least primarily, and I am indebted to all of the composers involved for their generosity in allowing me to portray them in this manner. The piece turns out to be, in addition, a large-scale documentation of an important stylistic that came into American concert music in about 1960. These composers of the "post-serial" / "post-Cage" movement have all made international reputations for the originality of their work and for their contributions to this area of musical compositions. The style of the video presentation comes from the need I felt to find a new way to show music being performed. The idea of the visual style of Music with Roots in the Aether is plain: to watch as closely as possible the action of the performers and to not "cut" the seen material in any way — that is, to not editorialize on the time domain of the music through arbitrary space-time substitutions. The visual style for showing the music being made became the "theater" (the stage) for the interviews, and the portraits of the composers were designed to happen in that style. The seven installments focus on the work of (in order) David Behrman, Philip Glass, Alvin Lucier, Gordon Mumma, Pauline Oliveros, Terry Riley and Ashley himself — representing the vanguard of contemporary composers — and include both lengthy interviews as well as performances. We've also included a link to a 2004 essay in The Brooklyn Rail by Kenneth Goldsmith: in it, Goldsmith appraises Music with Roots in the Aether as "a great snapshot of the period," and observes that "we're lucky that someone went through all this trouble to preserve a very valuable piece of musical history." The wonderful Fred Wah is visiting the University of Pennsylvania as part of the two-day North of Invention: A Canadian Poetry Festival (hosted by Charles Bernstein and Sarah Dowling at the Kelly Writers House), and was kind enough to hand deliver these two vintage recordings of Ed Dorn from his archives, which we've just added to our Ed Dorn author page. First up is a forty-six minute reading from the University of British Columbia, recorded in February 1962, which comes complete with an introduction from Robert Creeley and includes nine poems altogether, including "From Gloucester Out," "The Teepee at Tomah," "Death While Journeying," "An Old Love" and "So Long Cuba." Next, we have a brief ten-minute set from the University of New Mexico in Albuquerque, recorded in October 1963. Dorn starts with "Vaquero," continuing with "Wagon Wheels," "The Sea Corner, of the Eye," "Trail Creek, Aug. 11, the Reason of Higher Powers" and "Home on the Range, February 1962," before closing with "On the Debt My Mother Owed to Sears Roebuck." Taken together, these two recordings are now the earliest (by seven years) on PennSound's Ed Dorn author page, which includes readings and lectures from a dozen sources, including numerous samplings from his classic, Gunslinger. And speaking of Wah and North of Invention, if you missed yesterday's programming, you can still make it down to the Kelly Writers House for a full day of readings and presentations today, or tune in for live streaming video via KWH-TV. Al Filreis put up a blog post last night remarking on yesterday's events, and has been posting live comments through the Facebook pages for PennSound and the Kelly Writers House, along with the Twitter accounts of both (PennSound and KWH), and not only will PennSound be posting audio and video from the festival soon, but complementary materials from the conference will also be part of a feature on contemporary Canadian poetry and poetics in Jacket2 (organized by Dowling). One of the highlights of last fall's programming at the Kelly Writers House was a December 9th event, co-sponsored by UPenn's Center for Programs in Contemporary Writing and the Chinese / American Association for Poetry and Poetics, which brought together two groups of poets — one from Wuhan, the other from Philadelphia — for a cross-cultural dialogue. 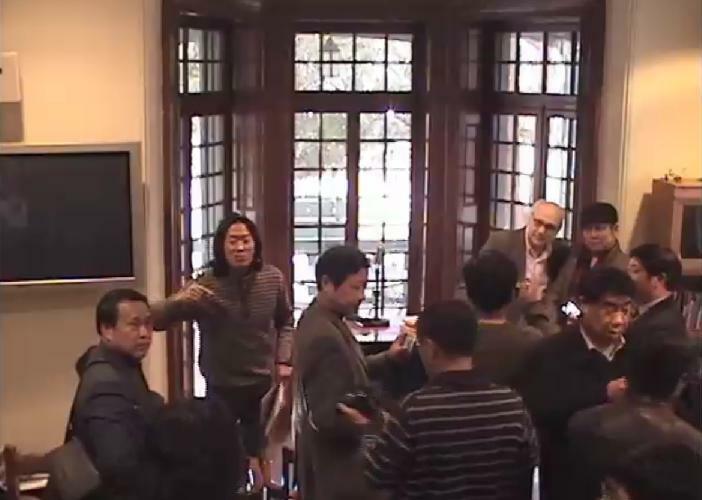 The Chinese poets delegation included Liang Biwen, Liu Yishan, Chen Ying-Song, Tiang He, Wang Xinmin, Ke Yumin, Hu Xiang and Liu An, while Philadelphia was represented by Bob Perelman, Sarah Dowling, Michelle Taransky, Charles Bernstein, Greg Djanikian and Yanrong (2010's CAAP Scholar-in-Residence). Work from each poet was shared bilingually, with the local poets reading English-language translations, as well as having their own work read in translation by the visiting Chinese poets, and KWH has put together a program with the full texts of everything read. Al Filreis highlighted the event in a blog post the day after the reading — he notes that "[f]or nearly all of [the Wuhan poets], this was the first visit to the U.S. Getting visas, dealing with protocols, was a major business, as you can imagine — much of it, on our end, handled nobly by Charles Bernstein, who, with Marjorie Perloff, chairs our Chinese/American Association of Poetry and Poetics" — and followed this up yesterday with a blog post featuring a self-shot video of Yanrong reading "Prophecy and Carnival". Ron Silliman recently blogged about the event as well, also drawing readers' attention to an earlier Writers Without Borders event featuring Zhimin Li (a CAAP board member), as well as a new CAAP call for papers for the First Convention of The Chinese / American Association for Poetry and Poetics, which will take place in Wuhan this September. You can read the complete CFP on the CAAP website, and to listen to and watch footage from this groundbreaking event, click on the title above. Following up last month's posting of a new Threads Talk Series event featuring Cecilia Vicuña, today, we're very happy to announce a new addition to the series from Jen Bervin. Entitled "Text from Textile: Stem & Root," this talk "in the form of a circle" was recorded in New York City on November 17, 2010, and includes readings from a non-breaking space (originally known as the cloud book) as well as The Desert. Unfortunately, due to technical difficulties, the recording here is from a backup source and of slightly lower quality than those typically presented as part of Threads, but we're very happy to have this documentation of a fascinating event. Co-curated by Steve Clay and Kyle Schlesinger, the Threads Talk Series "is devoted to the art of the book featuring poets, scholars, artists, and publishers," and seeks "to build on the discourse within book arts to explore and enrich relationships between various strands of book culture that are often approached in isolation," such as "poetry and writing, visual and performing arts, collaboration, design, printing, independent publishing, literary history, critical theory, and material culture to name a few." You can listen to six previous events featuring Cecilia Vicuña, Alan Loney, Charles Alexander, Simon Cutts, Buzz Spector and Jerome Rothenberg on PennSound's Threads Talk Series homepage. 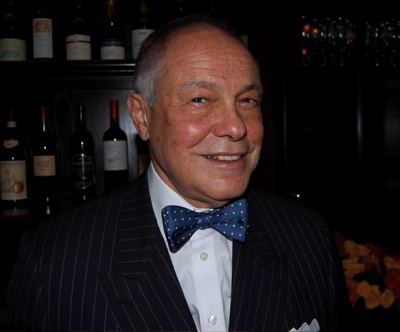 We bring this week to a close with a marvelous event, Art, Fantasy and Experience organized by Carla Billitteri at the Renee and Chaim Gross Center for the Arts in New York on December 12, 2010. 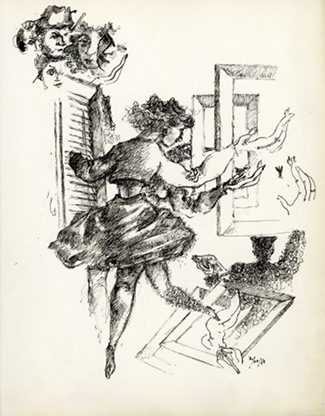 This reading, presented in conjunction with the exhibition Fantasy: Chaim Gross Drawings, 1944-1950 (which runs through March 31st), features an all-star roster of poets, including Elaine Equi, Nada Gordon, Rod Smith and Charles Bernstein. In her introduction, Billitteri discusses her motivations in inviting these poets to invite these four poets to take part in this event: "I see in their poetry, fantasy as the configuration of a conceptual space that undoes itself, or undoes its configuration; fantasy as the reconfiguration of familiar conceptual space in such a way as to distort it; and finally, fantasy as the presentation of an untranslatable, or only partially translatable experience. In this sense, fantasy is a sense memory." Brief sets from each poet (running approximately ten to fifteen minutes) are presented as both audio and video, with segmented tracks available for both Equi and Gordon's readings. These performances are followed by a short conversation period in which the poets discuss the role of fantasy in their poetry. You can see and hear all of these recordings on the special page we've put together for this event as well as on the individual author pages for each poet. To start exploring these fascinating readings, click on the title above. We couldn't be prouder to unveil our latest addition to the PennSound archives from UPenn emeritus professor John Richetti: a thoughtfully-chosen selection of sonnets by William Shakespeare. "Shakespeare wrote a long sonnet sequence," Richetti begins, "and I will be reading about half of those." Altogether, he reads eighty-one poems from the complete sequence of one hundred and fifty-four, making use of his preferred volume, The Sonnets and A Lover's Complaint (ed. John Kerrigan, Penguin Books) — an edition he recommends, "because the texts are good, and the notes — and notes are necessary because Shakespeare's sonnets, although some of them are familiar, many of them naturally are written in Elizabethan English, the English of his day, and they are highly allusive, full of puns and meanings of certain words have changed over the centuries." You can listen to this wonderful treasury of Shakespeare's work by clicking on the title above, and don't forget the other recordings Richetti has compiled for PennSound over the years, including The PennSound Anthology of Restoration and 18th-Century Verse (released in November 2009) and various recordings of works from Pope, Swift and Dryden, dating from 2007 and 2009, which are housed on his main PennSound author page. All of these recordings can also be found on our PennSound Classics homepage, along with a fascinating array of vintage works reinterpreted by the likes of Allen Ginsberg, Basil Bunting, F. Scott Fitzgerald, Caroline Bergvall, Rachel Blau DuPlessis and more.